With many thanks to Nexpose consultant Mark Doyle for his trust in me and his coaching and with thanks to my colleagues at $CLIENT for offering me the chance to learn something new! 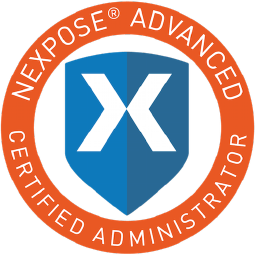 This morning I passed my NACA (Nexpose Advanced Certified Administrator) examination, with an 85% score. While preparing for the exam I searched online to find stories of test takers, describing their experiences with the NCA and NACA exams. Unfortunately I couldn't really find any, aside from one blogpost from 2012. For starters, the exam will be taken through Rapid7's ExpertTracks portal. If you're going to take their test, you might as well register beforehand. Purchasing the voucher through their website proved to be interesting: I ran into a few bugs which prevented my order from being properly processed. With the help of Rapid7's training department, things were sorted out in a few days and I got my voucher. There is no option to mark your questions for review, a feature most computer-based exams provide. Even if you could mark your questions, there apparently is no index page that allows you to quickly jump to specific questions. I made do with a notepad (to mark the questions) and by editing the URL in the address bar, to access the questions I wanted to review. The exam covers 75 questions, is "open book" and you're allowed to take 120 minutes. I finished in 44 minutes, with an 85% score (80% needed to pass). None of the questions struck me as badly worded, which is great! No apparent "traps" set out to trick you. I would really appreciate if you could help with practice questions or mock test links. I don't believe there are any mock tests out there, aside from perhaps a few examples on the Rapid7 website. But all things considered, the test is not hard: if you just know your way around Nexpose, if you've read the user and admin guides and if you are competent with (Google) searches, then you can pass the exam. Remember: it's open-book.